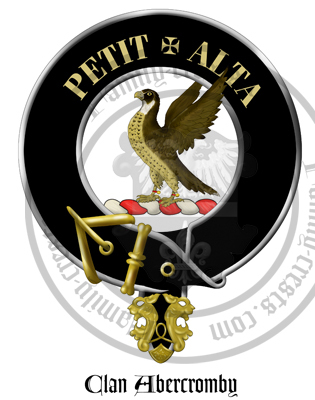 Clan Badge: A falcon rising belled proper. William de Abercromby did homage to Edward I of England in 1296 for his lands in the parish of Abercromby, Fife. The lineage of the family passed to the house of Abercromby of Birkenbog in Banffshire in the early seventeenth century. The history of the Abercrombies is intimately connected to religious discord, not only because the lands in Banff were granted to Alexander Abercromby by the Bishop of Aberdeen in 1362. Robert Abercromby (1534-1613) was a Jesuit priest of the Scottish mission who vehemently opposed the Reformation and its effect on the Scottish church. Most notably, he is alleged to have converted Queen Anne of Denmark, wife of James VI, to Catholicism before her death. In a similar vein of religious dissent, Alexander Abercromby became a fervent Covenanter strongly opposed to the imposition of an Episcopal church in Scotland by Charles I. This was a provocative and defiant stance that was punished by the quartering of troops at Birkenbog as part of a famous campaign to restore the authority of Charles I conducted by the Marquis of Montrose. David Abercromby became a Jesuit after study in Douai and followed in his kin's footsteps by opposing the Protestant faith on his return. However, he converted to Protestantism to the extent that he published a significant tract against Papal power, "Protestancy Proved Safer Than Popery", in 1682. A military connection is of equal importance to Abercromby history. Sir Ralph Abercromby (1734-1801), revered as one of the greatest military reformers, was a mentor to Wellington during the retreat from Europe in 1795 at the outset of the Napoleonic wars. The eventual success against Napoleon is attributed to Abercromby's restructuring of the army. Another notable success was the capture of the Spanish island of Trinidad for the British crown - the spoils of a conflict with the French in the West Indies that he had headed as Commander-in-Chief since 1795. He took an even more vital role in the Egypt campaign by commanding troops who took the strategic fortress of Aboukir from the French in the decisive Battle of Alexandria. Such military achievement is reflected in the honours bestowed upon his descendants and equalled in other fields. 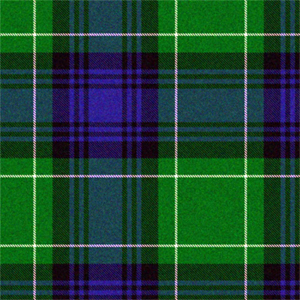 His widow was created Baroness Abercromby of Aboukir and Tullibody, a title that reflects the influence of this clan beyond their own land. Arms: Argent, a chevron gules, between three boars' heads erased azure. Crest: A falcon rising belled proper. Supporters: (Clan chief only) Two greyhounds argent, collared gules.